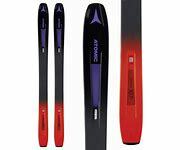 The Atomic Vantage 107 C W is the widest women’s Vantage ski we make. It’s the perfect mix of playfulness and power, with epic float when the freshies are falling and all the edge you need when it’s time for blazing fast runs in-bounds. You’ll feel lighter thanks to revolutionary Prolite construction with added reinforcements in key zones – for a stiffness and strength tuned for female skiers. HRZN Tech Tip increases surface area by 10% for better floatation, while reducing deflection for smoother, safe skiing. For girls who want lay tracks over the entire mountain with a ski that helps them ski their best, there are no better choices than the Vantage 107 C W.